Our Version of Moon Sand :). Fairy Dust Teaching shared a great post on making moon sand the other day, and I realized that we had not made any of ours in a long time! So, today..... We made some! Moon sand is great because it is like a sand, but when you mold it, it keeps the shape. So, now instead of *cross your fingers* snowballs, we can make sand balls! The sand also compacts nicely to make mountains and volcanoes. I'll keep you posted if we do! Oh!!! And don't forget, I'm posting my What Would You Do With It? post on Friday this week instead of today! Tinkerlab is celebrating a blogiversary and a large group of bloggers are taking a cardboard box challenge, Do you have any great ideas on how to use a box????? Yes Dawn- We love our moon sand! Especially when we can do it ourselves :). On an update note, I opted not to try the other recipe this afternoon. The sun came out and we spent all of our time outside! 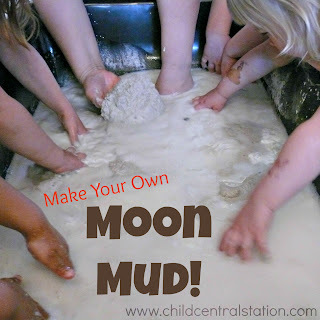 we still have yet to make some moon sand - its on my list! Thanks! I so love the idea of adding oil - I am going to make another batch for our ocean theme and I am doing your recipe. I will be linking back to you -thanks for sharing your recipe! This looks like so much fun! So cool that you use the whole table to let them mix it all up. Amy, Thanks so much for this recipe. 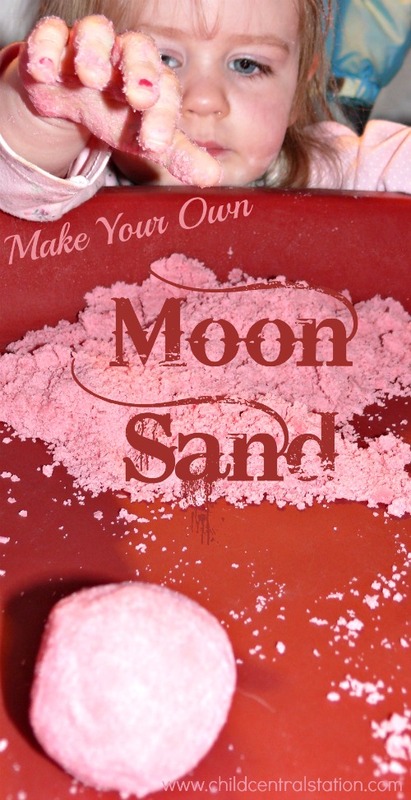 I didn't know there was a way to make home made moon sand - it sounds like a good science activity as well as of course fun to play with the finished project. Beautiful photos, as always!I'm glad you were able to get outside in the afternoon! Amanda- It depends. It will keep for quite some time, but I only keep mine based up on usage. If there are a lot of children using it, I wouldn't keep it longer than a week. Although we require hand washing before and after play, germs could still be spread. Abbie- I love our sensory table. (Although it is plastic-- we have a lot of plastic I'm working on trying to get rid of and replace with other more natural materials... It is a process...) The table works great for so many things, and for our home, this one is just the perfect size. It isn't as small as some, but is definitely not the "full size" that a lot of sensory tables are. Brenda- Thanks we had a great time.... With hours outside, the park and the yard. We are soaking up this nice weather while we have it! Sally - I'm glad you shared your recipe too. I know we will test it out and have the children compare the recipes to decide which one they like best. We probably wouldn't have made it if you hadn't posted your recipe as a reminder! You know how you have so many different things and ideas of what to do, and sometimes a few get lost in the shuffle.... This was one of those things! It has been months since we made this stuff :) So, thanks for triggering my memory! Jaime- You'll have a great time with it, I know all of the children here do. Neat! Thanks for the recipe. Where do you get the colored sand? Craft store?